The outstanding power generated by its 125-cc. engine led MV Agusta to try its luck' in the 250 class with a motorcycle closely modeled on the 125 version. The new vehicle's displacement was increased to 203 cc. It may be that the attempt simply to increase the 125's displacement was due to tactical reasons rather than total conviction. In order to beat the NSU Sportmax and the Moto Guzzi Gambalunghino, a rival company would have had to go all out and make no mistakes. Racing an "experimental" vehicle would make a failure seem less embarrassing. But the MV Agusta 203 made a fine name for itself at once, even against its larger-displacement competitors. In 1955 the German Herman Muller won the racer's championship with an NSU, but the manufacturer's title went to the MV team. The following year the MV 203 became a genuine 250, but ironically enough the more powerful model was not good enough to prevent Mondial from taking the title. The 1958 season, however, was a success. Growing pains were past and the 250 won the title again, this time driven by Provini rather than Ubbiali. After winning the championship, the former 203—which had surpassed all expectations—was replaced by a two-cylinder model that had already been put into occasional races. Power: 27 h.p. at 11,000 r.p.m. Maximum speed: About 125 m.p.h. 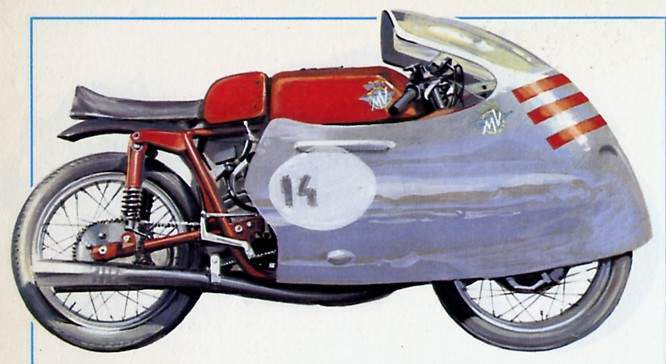 The MV Agusta won perhaps unexpected success in the 250 class, first with the 203-cc. engine and then with the 250-cc. Both were single-cylinder motorcycles. Then the company decided to develop a model that was capable of even greater possibilities of success. In 1959 it put the 250 two-cylinder into the field. The two-cylinder model had been ready for years, but its only victory had been at the Belgian Grand Prix in 1957. As compared with the 33-34 h.p. of the 250 single-cylinder, the two-cylinder model presented its rivals with the challenge of 37 h.p. at 12,500 r.p.m., which was such a high rotation speed that it stirred controversy among theorists in the field of mechanics who did not think the engine could stand up to such strain. Carlo Ubbiali and Tarquinio Provini were called in to drive the new MV Agusta 250. The two leading Italian racers of the day fought tooth and nail for victory, but their rivalry with one another was so fierce that their teamwork suffered. Both the world championship races and the Italian races that they entered were studded with controversies that overshadowed their responsibilities to the racing department of MV Agusta. 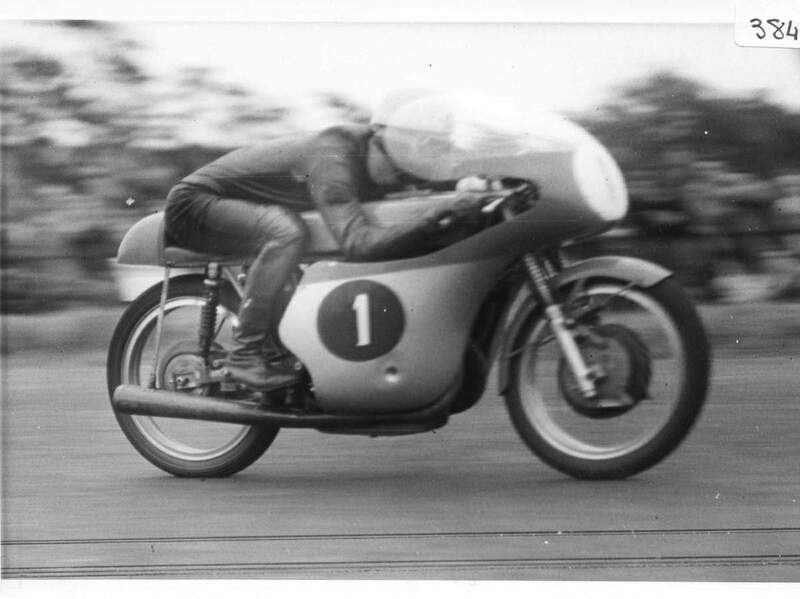 Apart from all that, the MV 250 two-cylinder easily won the crown in 1959 and 1960. Power: 37 h.p. at 12,500 r.p.m. Maximum speed: Over 135 m.p.h.